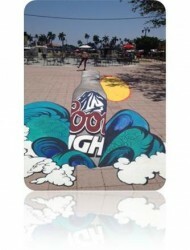 Silver Bullet Summer campaign will showcase amazing three-dimensional art displays in five cities across the country. At these exhibits, passersby will be able to interact with an oversized Silver Bullet Pint literally “splashing down” in the form of large 3D artwork customized to that city. On June 29-30, the exhibition comes to Chi-town – 455 N. Cityfront Plaza Dr. It is open to the public and everyone will get a chance to interact with the 3D art and with the world-renowned artists. This optical illusion comes to life when people take pictures and video posing with the pint. The event is open to the public free of charge: Friday, 6/29 from 6am – 5:30 am and Saturday, 6/30 from 10 am – 8 pm.